You probably also should make note of the Unseen Tumblr account since I’ll be posting pictures from the road once things start up and there are things to photograph. Because of scheduling both of the festoval and of our handy reporters the coverage may not be as expansive as last year where we did over 100 features and short films. This year it looks to be about 20 films less than that, then again one never knows how things will change do to mood and such. 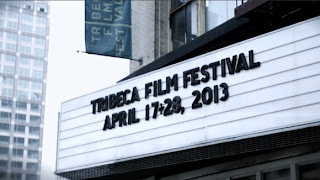 Lest you think that things are going to be all Tribeca, not to fear there are three other festivals that will be getting the Unseen treatment at the same, first off will be reviewing all of the films at Kino! New Films from Germany at MOMA, We'll be taking in some of Subway Cinema’s Old School Kung Fu at Anthology Archives and finally I've got some reviews of some of the films at Hot Docs in Toronto. The result is going to be an April that is back loaded with way too many films…too many good films at least as far as those festivals are concerned. Things are getting so crazy that if you see someone walking around twitching and mumbling I'm Elmer J Fudd Millionaire I own a mansion and a yacht, it’s probably me.